We have come pretty far now. Tim and I are living in our home finally. We moved in the week his parents arrived for a visit at the end of January. Talk about cutting it close, but they were super helpful while they were here. We got everything livable and even had time to play a little. I’m going to back up a bit, and walk you through some of the bigger projects we tackled in January. Tim had a guy’s snowboarding trip planned to Steamboat, so I took the opportunity of alone time at the house to start the cabinetry overhaul. I knew this would be a big job, but also would have a big impact on the way the space looked. Tim would be gone for a week, so my goal was to have all the cabinets (and some doors if I was lucky) sanded and primed before he got back. I will try to be specific for those of you who might be wanting to re-do cabinets one day. Thanks to my local Benjamin Moore dealer Lucas Paint, I had a good idea of where to begin. 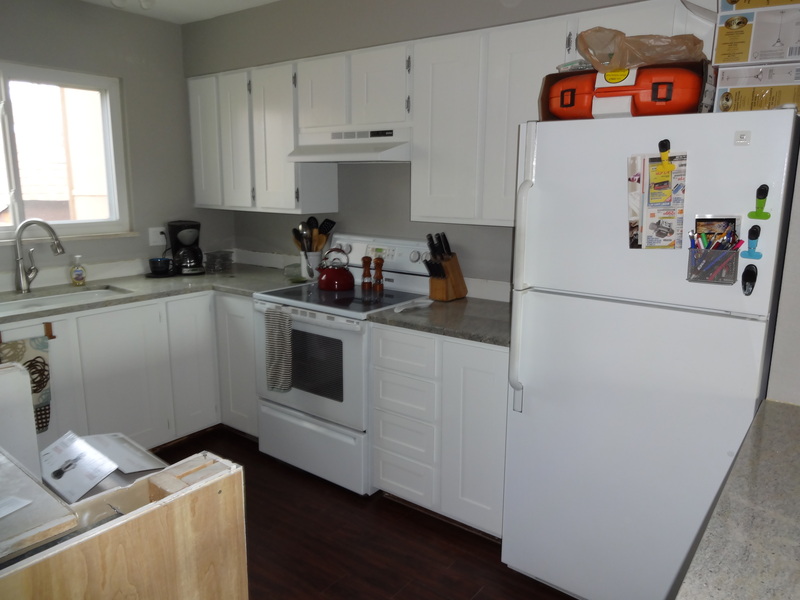 The plan was to end up with a white, shaker-style cabinet, even though I started with faux wood laminate. 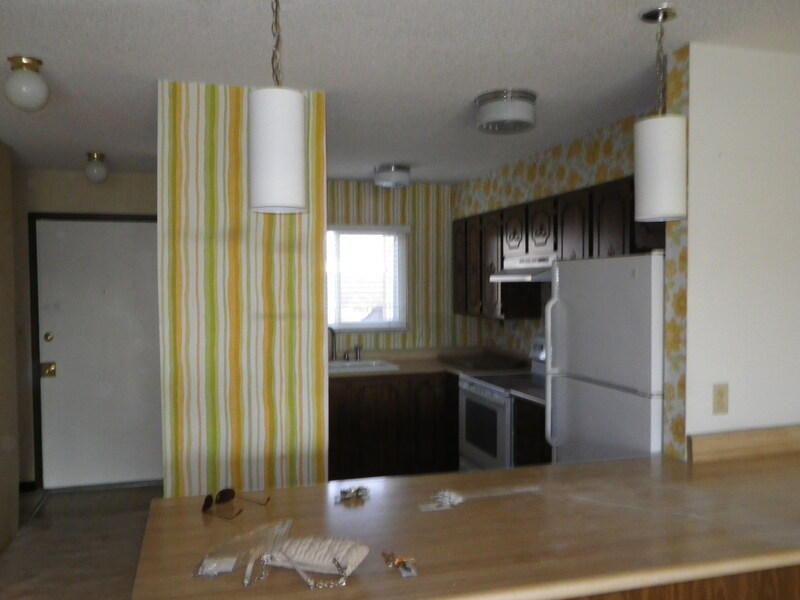 What the kitchen looked like the day we bought it. 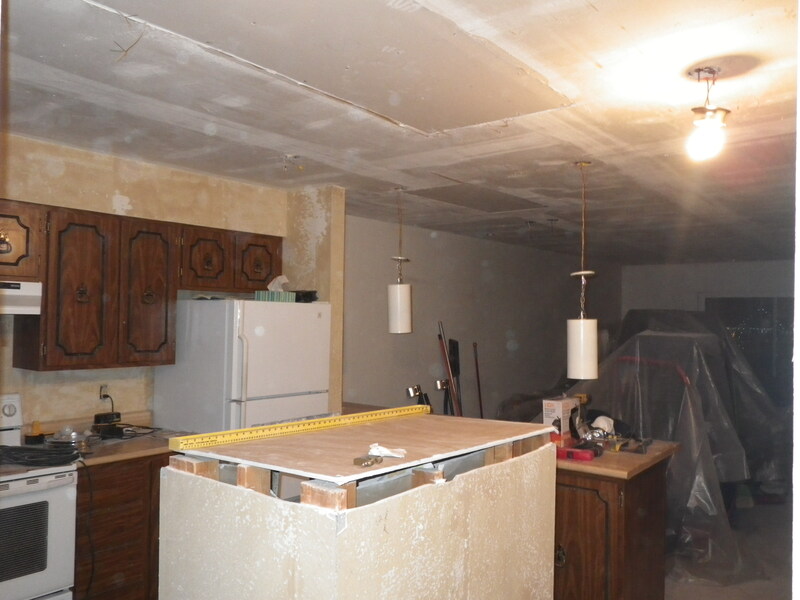 Kitchen with pantry cut in half to make an island, the wall paper gone, and the popcorn ceiling scraped. Mr. Lucas, from the paint store, told me to clean all the surfaces with dry dishwashing detergent powder before sanding. This is a strong degreaser, and I noticed it seemed to kind of change the laminate surface too… made it more penetrable to sanding, if that is possible. This was really hard on my hands, so I was sure to wear gloves, goggles and a mask. The process went like this: wipe down with water, scrub with detergent, wipe off detergent (if any was left during sanding, it would ruin the sandpaper), let dry, sand. I used an old palm sander and 120 grit paper, which I was very grateful for. Doing this by hand would have killed me. 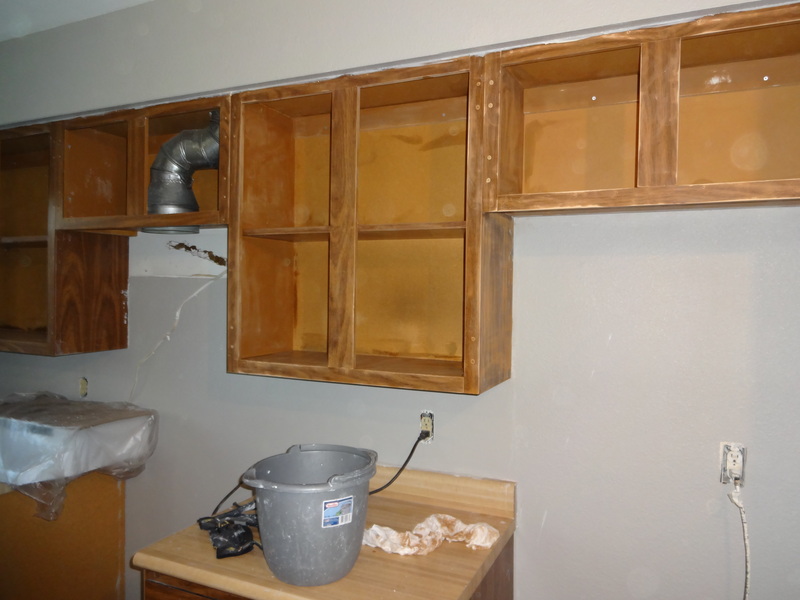 The wall-mounted cabinets during the sanding process. You can see we have already textured and painted the walls. 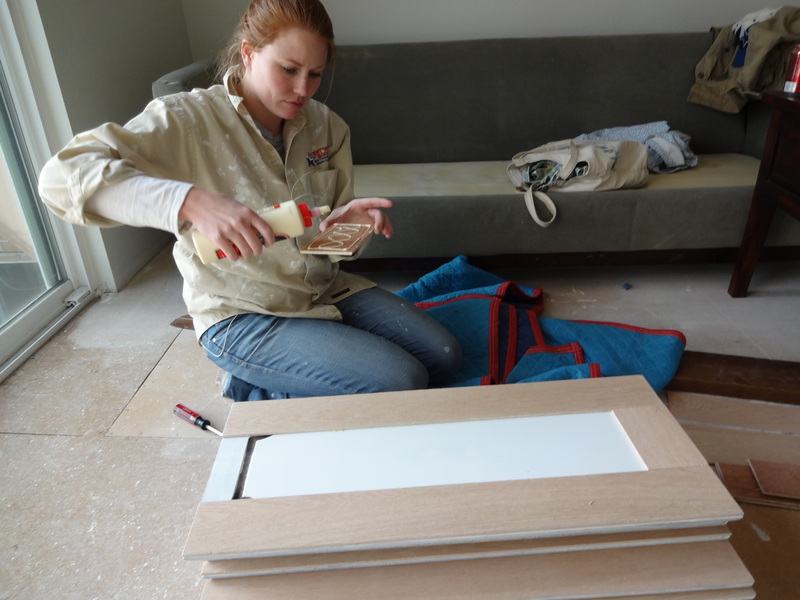 Me sanding the doors. I had an assembly line where I would scrub them down, wash them off, sand them and clean them again. All before priming. After all the sanding was cleaning. 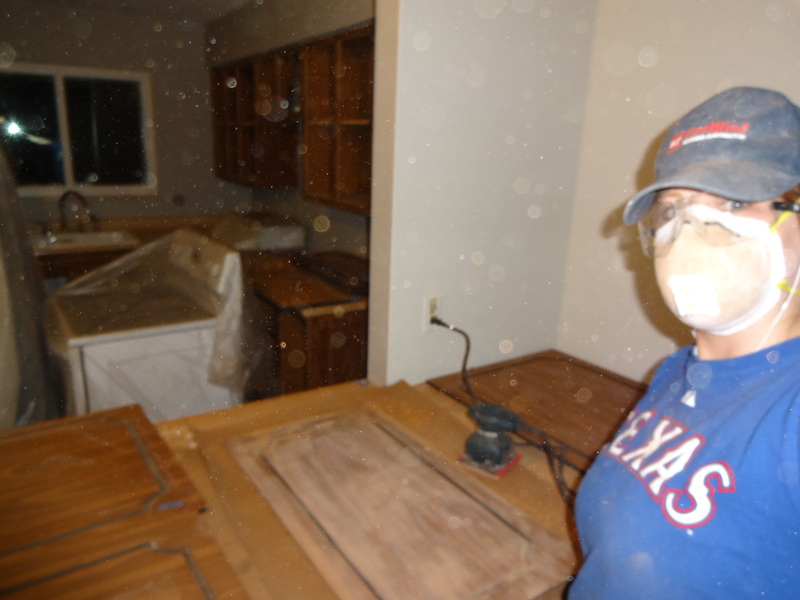 I had to repeatedly wipe down the surfaces for the cabinets to make sure all the fine laminate dust was gone. This seemed to take forever and I even took the Shop Vac to the doors after sanding. I also ended up using a lightly dampened cloth with a water and vinegar spray. It seemed to do the trick and dry quickly. Then I could move on to primer. I used BIN primer. It is alcohol based, so it has a really strong smell, but it dries quickly and sticks to anything. 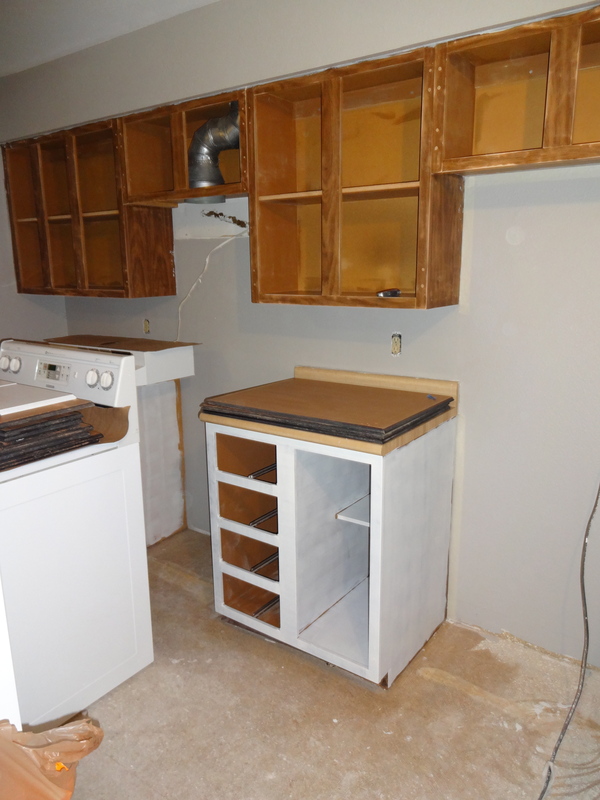 Bottom cabinets primed and drying. 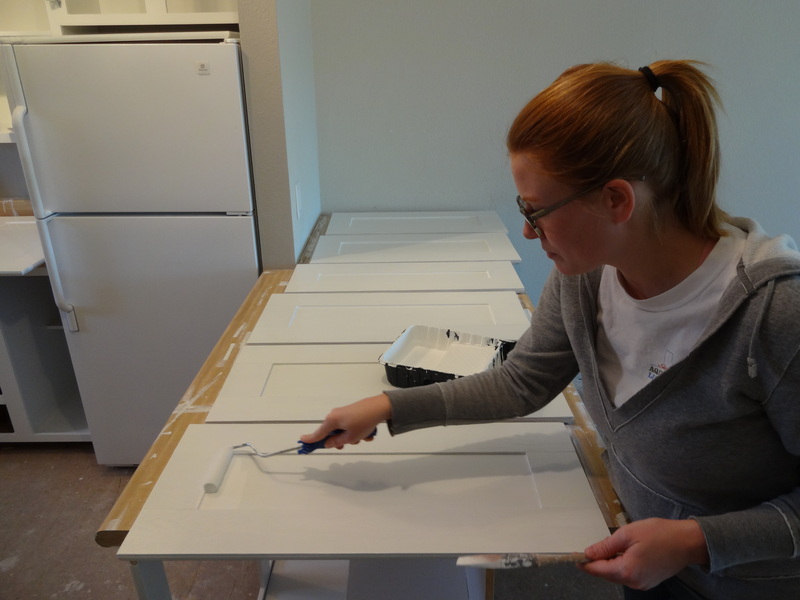 All cabinets are primed, but the doors took a while because I had to lay them flat to dry on each side. I had reached my goal when Tim and his friend Drew got back from their trip. Drew had offered to stay a few extra days and help! He replaced every outlet and light switch in the entire house making it look instantly more updated. 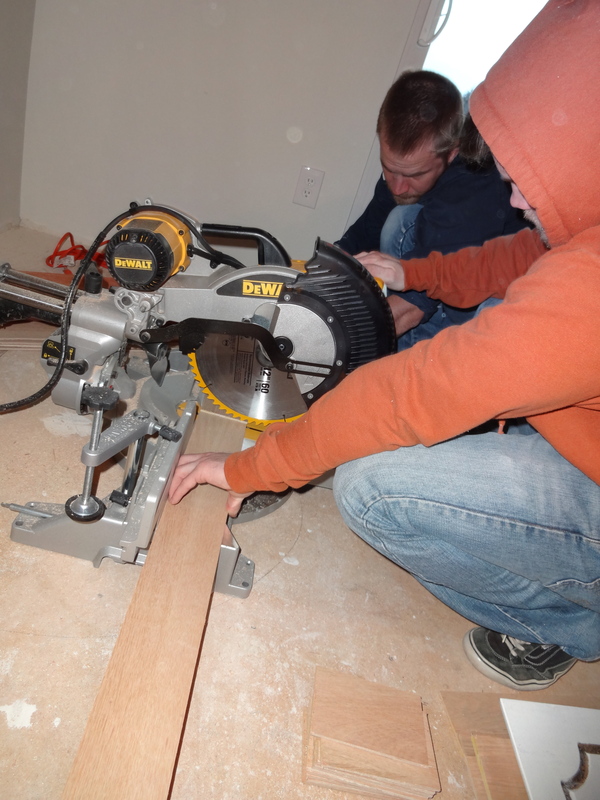 Drew and Tim cutting wood to reface the cabinet in a shaker style. 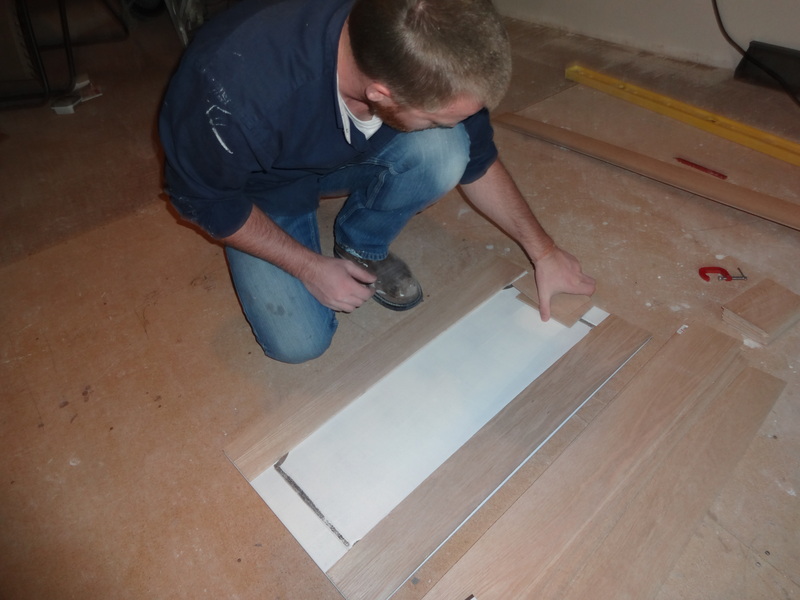 We had to make the wood strips 3.75″ wide to hide all of the outdated design that was on the cabinet face. I used wood glue to adhere the strips to the door faces. I used Benjamin Moore Advance in semi-gloss finish and White Heron color. It’s a slightly off white that really lends itself to gray, looking nice with the wall color. The Advance paint was again recommended by Lucas Paint in Denver. It is a Latex paint that behaves a lot like an oil-based, leaving no paint strokes and wears well over time. I realized along the way that using a small foam roller left some bubbles in the paint, so I would roll the paint on and run over it with a high quality 2″ angle brush. This technique worked well and left a smooth finish. 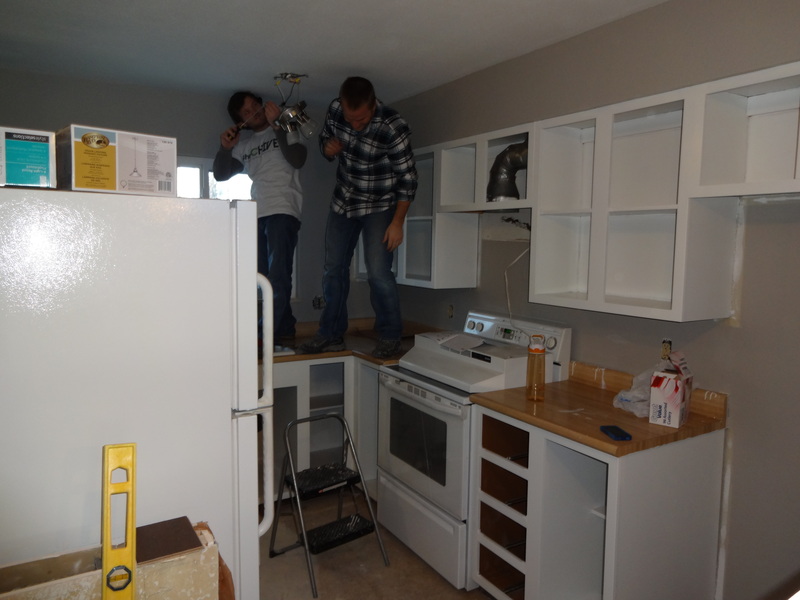 Tim and Drew are hanging a kitchen fixture. 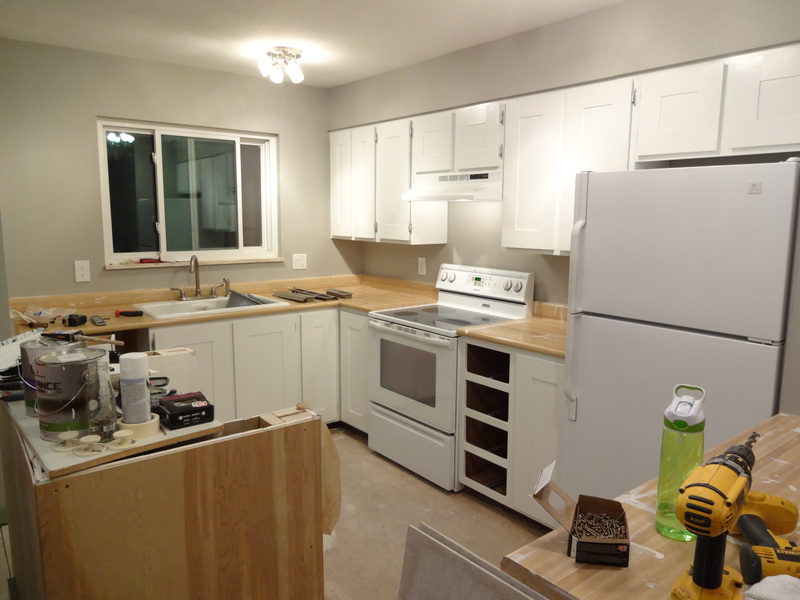 You can see the first coat of paint on the cabinets. I’m rolling the paint onto the new cabinet faces. 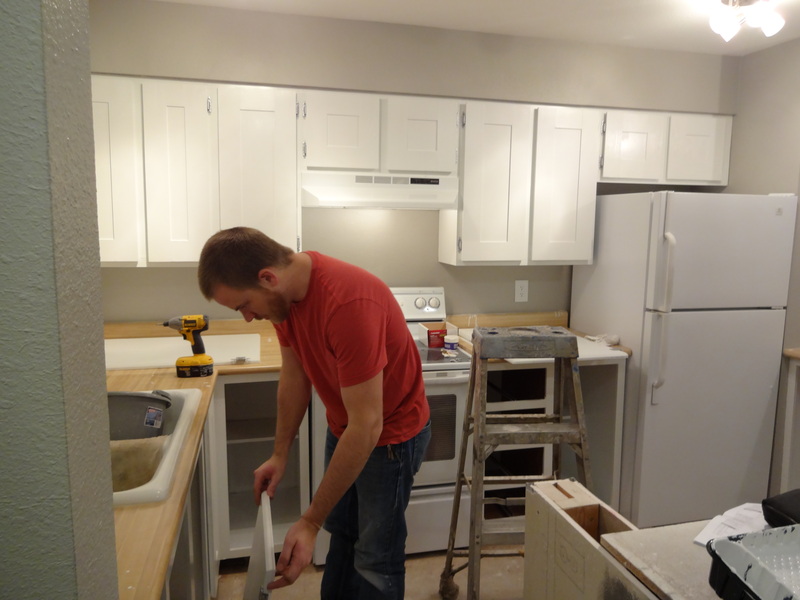 Tim installing the refinished cabinet doors. Kitchen after two coats of paint. We decided to add the trim to the face of the drawers as well. The next big project we had to complete before Tim’s parents arrived was the flooring. We chose a laminate that looks like a dark hand-scraped hickory by Evoke. 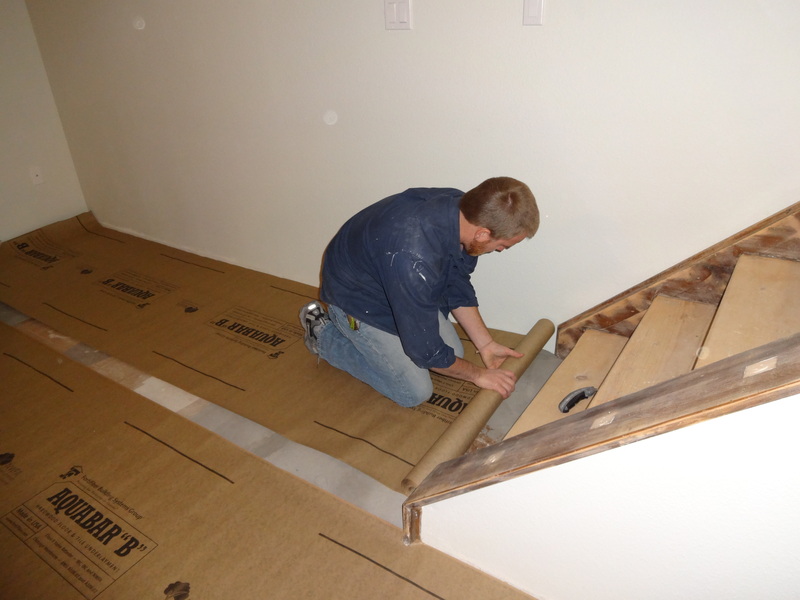 Tim was confident in his flooring installation skills, but had no experience leveling floors. We had a very unlevel particle board sub-floor on top of a layer of plywood, which made it tough. 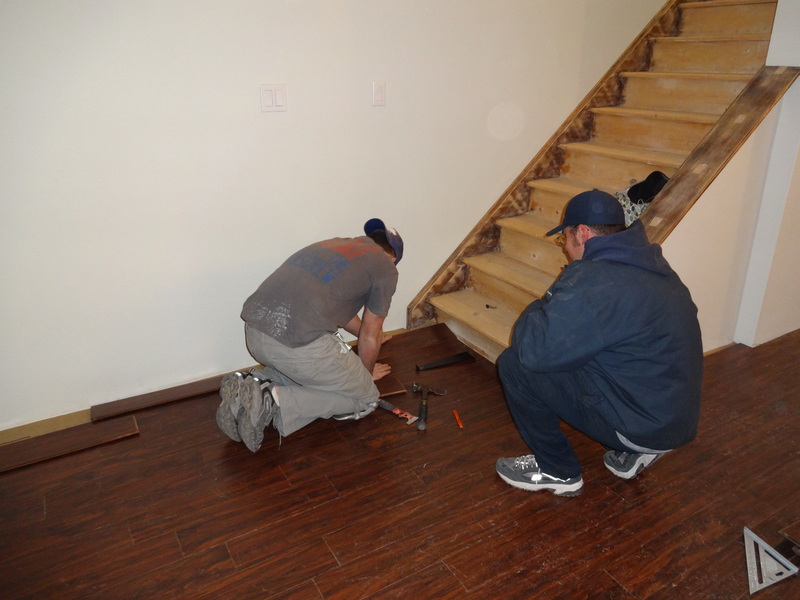 We got several different opinions on how to level the floor, but were still unsure which route would be the best. Finally, Tim decided which one he felt more comfortable with — a self-leveling concrete-based product that you prime, pour, and spread. Tim working on leveling the floor. We had the biggest dip in the floor near the back door. All the gray areas are low spots in the floor. 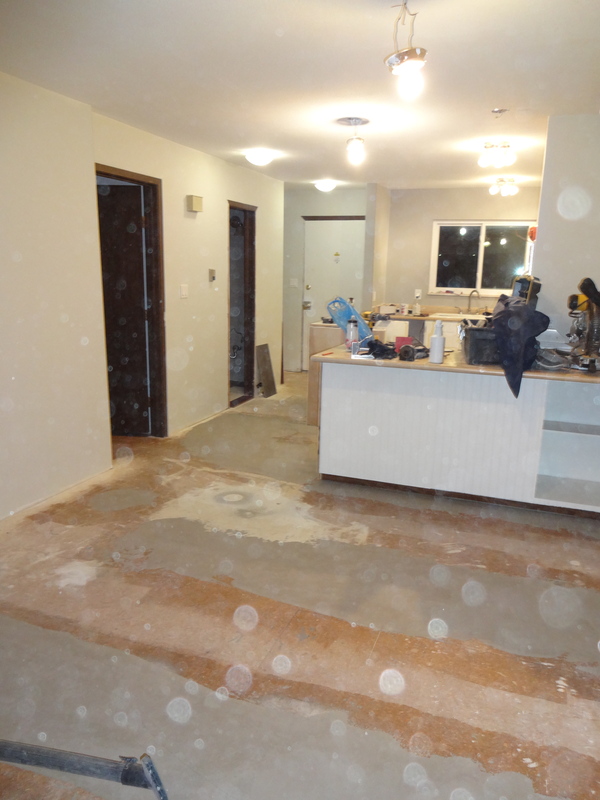 Once the floor was level and dry, we laid down a moisture barrier. Yeah, flooring, finally! We had to maintain the correct spacing from the walls and make sure the seams were staggered. I laid out the pieces and Tim installed them. 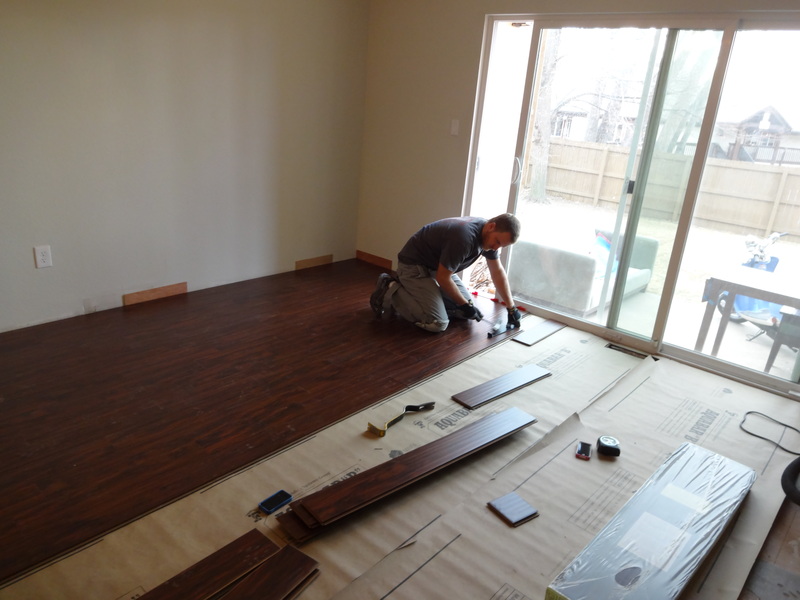 The last few pieces of flooring going in with our neighbor Travis helping. The morning that Tim’s parents arrived, we had new countertops installed. We got an amazing deal after hunting around the city. 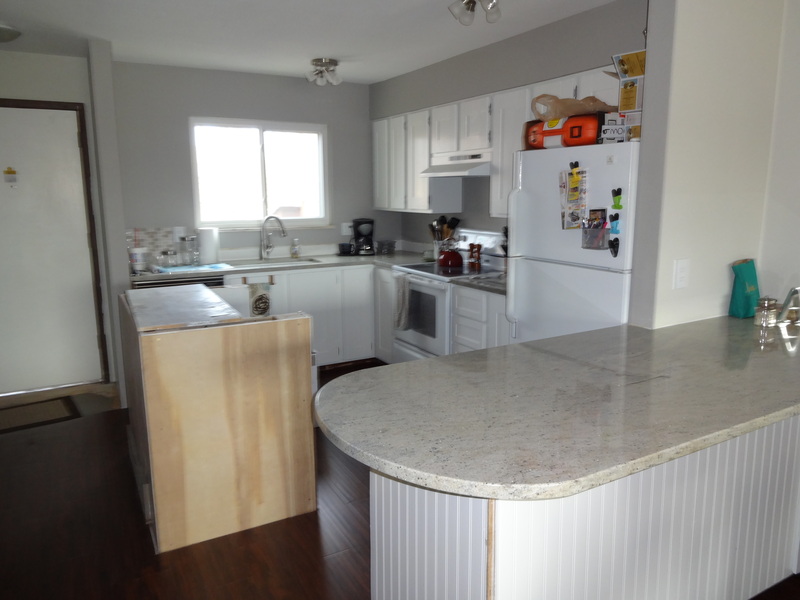 We picked a Kashmir White granite because of the look and the price. We still have to put on the finishing touches, but we are getting there! 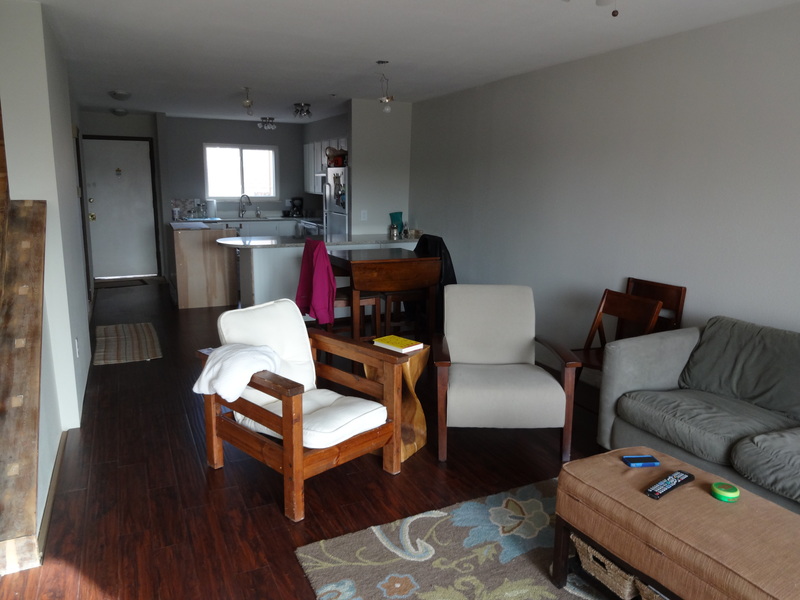 We moved in some of our furniture and Debbie helped me arrange and rearrange. 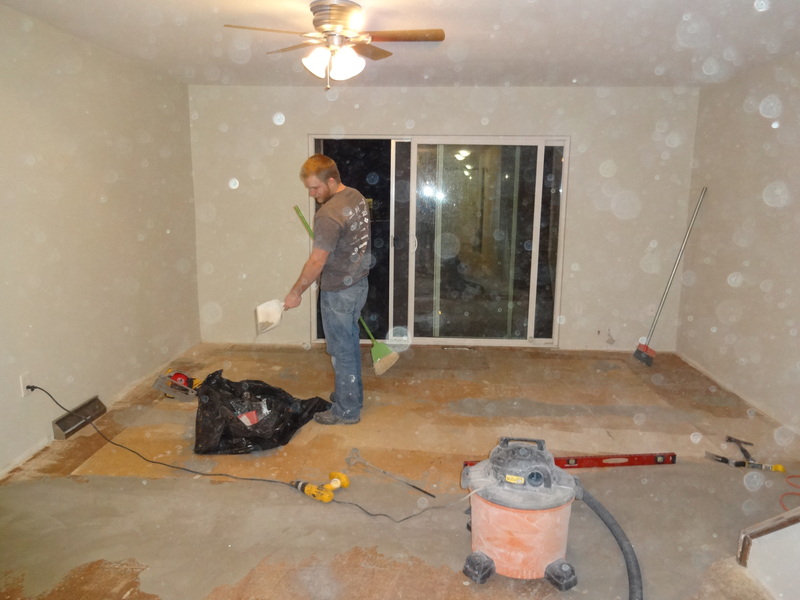 We had to clean the floor over and over from all the construction dust. My white kitchen. 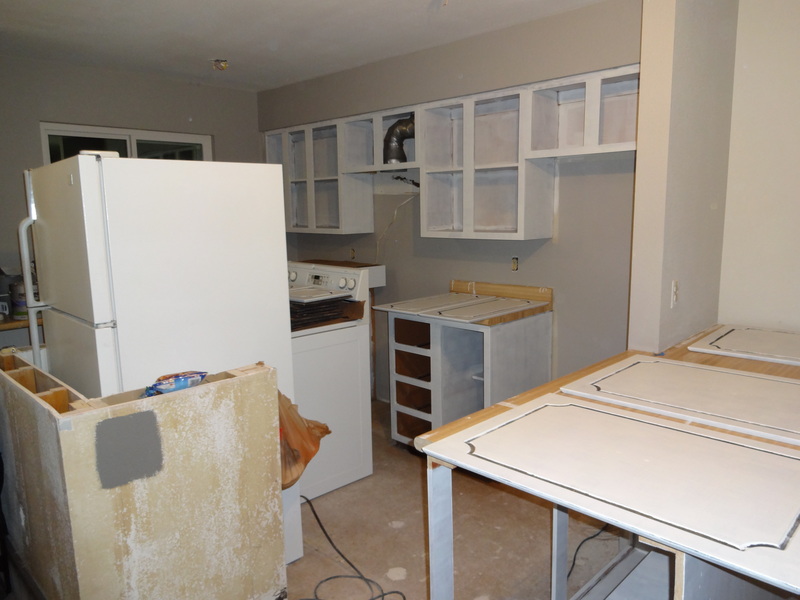 We have to trim it out, add the cabinet pulls and work on the island, but it is a vast improvement. It’s finally functioning, most importantly. Wow Meredith that is soo impressive! It looks great! I’m so proud for you guys! I hope all is well and hope you see you 2 soon! So cool! Looks like everything is coming along beautifully. Keep up the great work! You guys have done a great job I love the white cabinets Meredith, girl after my own heart=) The floors look great. Wish we could see it in person, maybe one day! Pingback: Big News — Back to Mexico | Escaping the "American Dream"